Use of the location-based service Foursquare is on the up and up. But it’s use is mainly limited to mobile phones currently. That makes sense since the service is all about sending your location when on the go. But it would be nice sometimes to use it on your computer (beyond visiting the rudimentary mobile site from your browser). Enter FoursquareX. 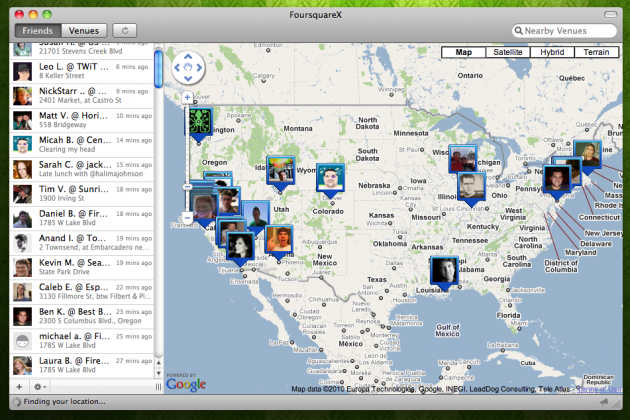 This new application built by software developer Eric Butler is easily the best way I’ve ever seen to interact with Foursquare on a computer. 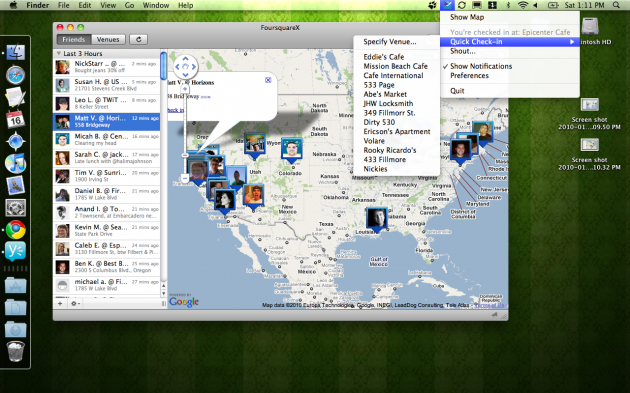 Using Foursquare’s API, Butler has made a OS X client that not only allows you to see where your friends are, but even allows you to check-in at venues. And when paired with the notification application Growl, it’s a great way to get alerted about what’s happening on Foursquare without having to check your phone every few minutes. The app is mainly meant to run in the background in your menu bar to serve you notifications (again, via Growl) when friends check-in places. 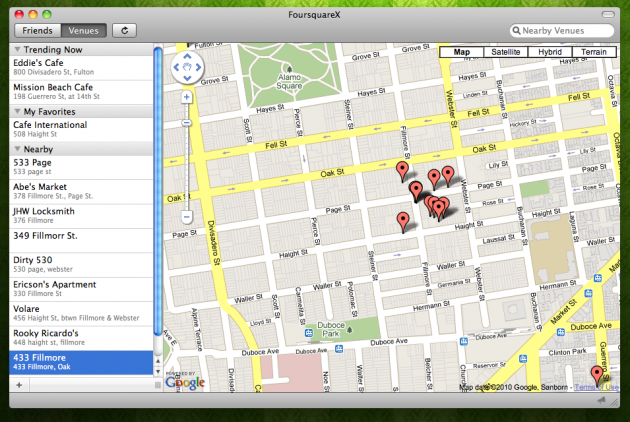 But the more interesting part of the app may be its map component. If you open that up, you’ll get a window displaying a Google Map with all of your friends’ Foursquare icons overlaid on it to show where they are in the world. You can zoom in or out to show more detail of where they are. Or you can click on their names displayed in a timeline to the left of the map to bring up more details about their latest check-in. There’s another view to this map too which gives you a visual representation of the Foursquare venues close to where you currently are. 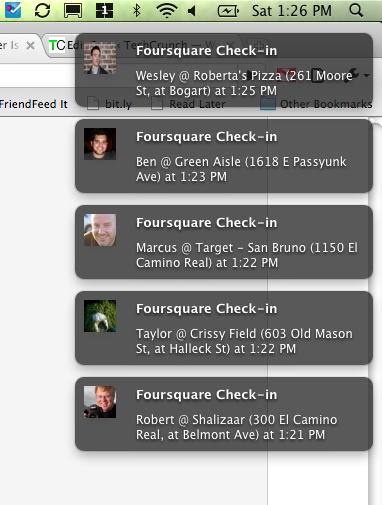 Clicking on any of them allows you to easily check-in. To the right of this map view there is a list of the venues currently trending on Foursquare (where multiple people are checking-in) as well as your “favorites” (the venues you check-in to the most). There is also a setting for the app that lets you get notifications when other people check-in to the same venue you’re checked-in at, even if you don’t know them. Some people may not like that, but if you’re interested in meeting new people that you have at least one thing in common with (your use of Foursquare), it’s kind of an interesting way to do that. 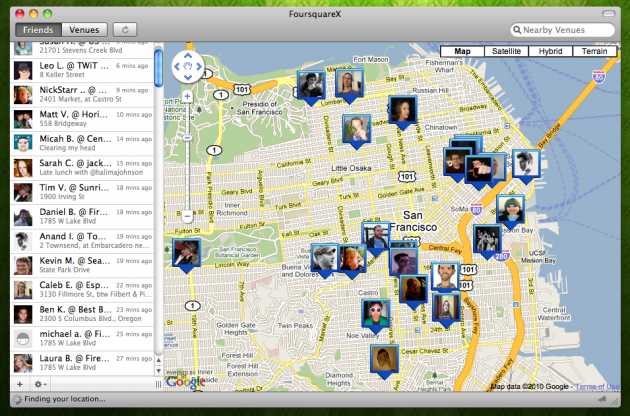 Again, this app is currently Mac-only (and specifically, Snow Leopard-only), but if you’re addicted to Foursquare, it’s a must-have. Find it here.